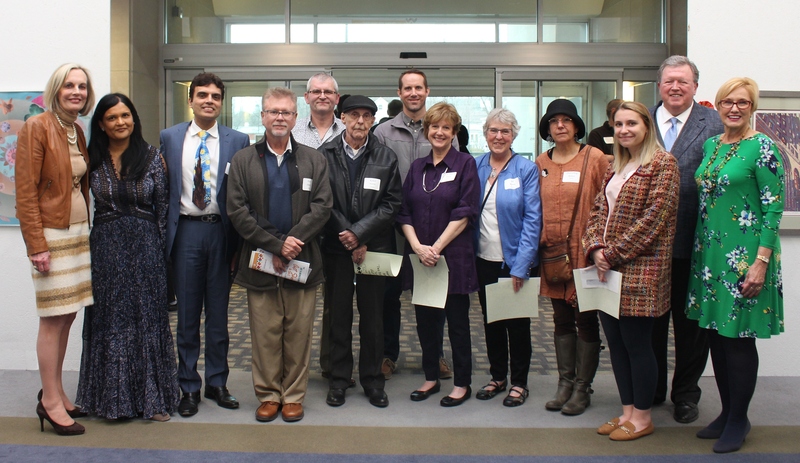 Awards were presented during an Adult Artist Reception on Thursday, April 4. From left are Dr. Maureen Barber Carey, Executive Vice President; Drs. Mona and Jay Kang, Art Show sponsors; Francis Demaske, Honorable Mention; Peter Garami, Honorable Mention/Photography; Robert Harris, Honorable Mention; R. Reynolds Frost, Best of Show/Photography; Lynn Marie Fizel, Honorable Mention; Jill Rouke, Best of Show; Dorothy Kloss, Honorable Mention/Photography; Maggie Rutkowski, Honorable Mention Photography; John Barber, President & Chief Executive Officer; and Bridget Barber, Vice President, External Affairs.